The Royal Netherlands Army is one of the highest-priority cooperation partners of the German Army. To demonstrate this, a ‘Declaration of Intent between the German and Dutch Ministers of Defence on the further Enhancement of the bilateral Relations in the field of Defence’ was signed on 28 may 2013. Respective Dutch and German leaders meet regularly and frequently, thinking and acting out of the box based on a very deep mutual trust and understanding in a very practical manner in order to achieve efficient and beneficial results for our respective armies. In this article, I will highlight some general principles with regard to the German view on multinational cooperation. I will also give a situational update on Project Griffin, a project that illustrates that German-Dutch cooperation is much more than pure symbolism. 2014 will be a special year for the Royal Netherlands Army (RNLA) because throughout that year the RNLA will commemorate its bicentennial. As Chief of Staff of the German Army I would like to congratulate our Dutch comrades and I highly appreciate the opportunity to share my views on our cooperation. 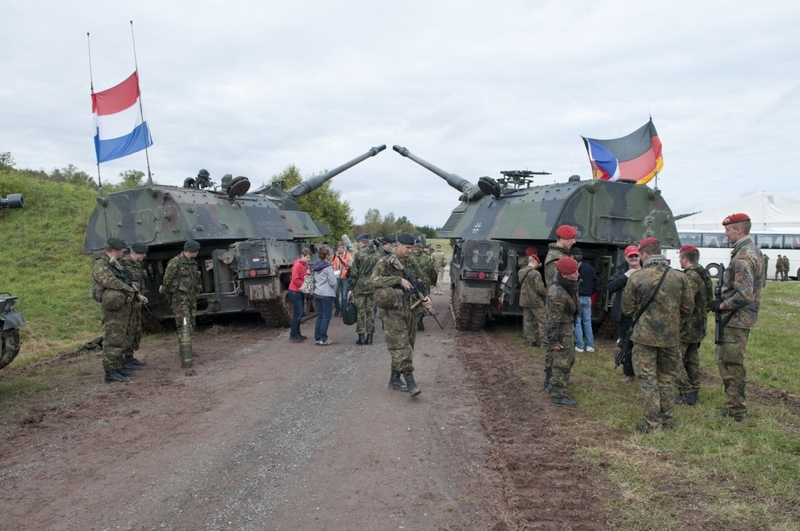 As to our Dutch comrades, we speak of one of the highest-priority cooperation partners of the German Army. Still today we can learn a lot from each other. The unique character of the cooperation between our two armies is well symbolized by the famous Griffin – and our cooperation is much more than pure symbolism. The way we run that cooperation is a very pragmatic one: the respective leaders meet regularly and frequently, thinking and acting out of the box based on very deep mutual trust and understanding in a very practical manner in order to achieve efficient and beneficial results for our respective armies. Following that idea we have already walked long distances on the path of cooperation and achieved impressive progress. Last year Project Griffin was ready to take off. 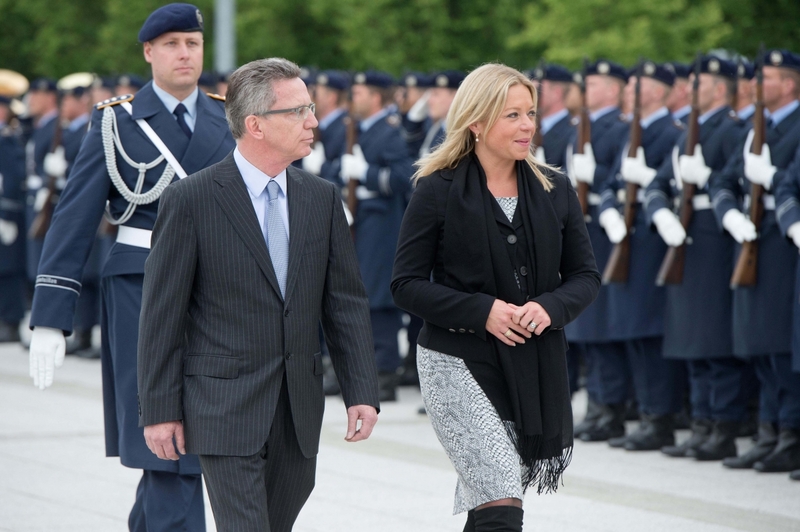 The ‘Declaration of Intent between the German and Dutch Ministers of Defence on the further Enhancement of the bilateral Relations in the field of Defence’ was signed on 28 may 2013. After almost one and a half years of investigations we were ready to start practical work. But as we all know, ‘necessity is the mother of invention’: Project Griffin has not been completed yet, only the first steps have been made and further ones will follow. Prior to a situational update on Griffin I would like to highlight some general principles with regard to the German view on multinational cooperation. Germany’s security is inextricably linked to political developments in Europe and throughout the world. Increased international integration in all areas is resulting in growing interdependence between states, which is increasingly affecting their respective security policies. Germany’s security objectives and interests can only be pursued in cooperation with its partners. The United Nations, the North Atlantic Treaty Organization and the European Union are the international framework of our security and defence policy. Today, safeguarding our interests is only possible in a whole-of-government approach. We therefore need a national, comprehensive and coordinated security policy that includes political and diplomatic initiatives as well as economic, development policy, police, humanitarian, social and military measures. With a view to force planning and against the background of the existing scarcity of resources (financial crisis in the Euro zone), it is also imperative to achieve a multinational balance between an efficient specialisation on the one hand and the basic provision of core military capabilities on the other. Consistent steps towards integration such as Smart Defence as well as Pooling and Sharing are apt to reinforce the European pillar of NATO and give Europe its own independent capabilities. ‘Panta rhei – everything flows’ is a quote attributed to the Greek philosopher Heraclitus. At that time he stated that our world is subject to continuous change. Although this basic principle has remained unchanged until today, the pace at which the changes occur has indeed changed in all walks of life. Moreover – unlike before – today’s processes of change often are of global dimension. Economic transformations have rapid world-wide effects – as exemplified by the global financial and economic crises that have been with us for several years now. Social and ethnic tensions that occur in a certain area quickly become a security problem affecting the entire region. Media operating on a global scale, close economic ties, long-distance journeys, but also modern means of communication such as the internet all contribute to the effect that the understanding of these changes and their ramifications spreads at a breathtaking pace around the globe. In particular, free trade routes and an ensured supply of raw materials are of vital importance to the future of Germany and Europe. In times of scarce budgetary resources, close cooperation in this field is essential – in particular in Europe. For this reason, multinational preventive security remains a fundamental principle of German security and defence policy. We want to serve the peace in the world as a reliable partner in a strengthened Europe. Also in the future, the German Army will make an essential contribution to military performance and burden-sharing within Europe and NATO through multinational cooperation and integration, side by side with numerous partners, with the Netherlands being one of the closest. Bundeswehr deployments are always multinational. Therefore, all Army units are rendered capable of integrating into multinational structures through comprehensive training and education. As already in its basic organizational structure, our operational units are also firmly integrated into multinational structures and maintain manifold international relations. This applies to all key areas: from structure to doctrine, training and exercises, through to materiel provision. Already today, approximately 10 percent of the Army personnel are serving in multinational structures – beyond deployments – for instance in the multinational (MN) corps and their assigned forces or with the French-German Brigade. In sum: with the ARMY2011 structure we are looking at a capability profile meeting the national level of ambition in terms of width, depth, and international integration in such a way that extensions within the scope of smart defence and pooling and sharing, respectively, can be made without any problem – if this is the political will. Our primary goal is to maintain capabilities in a combined manner in view of armed forces diminishing in size and tight budgets. The German Army is prepared to play an active role in Europe as a ‘docking’ partner (Framework Nation) and is already acting as such. Common beliefs are important but they must also be filled with life. It is therefore important to me that the Netherlands and Germany continue to use all opportunities available to intensify practical cooperation ensuring their capacity to act and ensuring their operational readiness – especially concerning ‘land ops’ and synchronizing land force command and control. With regard to our common Project Griffin, we are ready to take innovative and even bold steps to make our two armies better for future operations. From the German point of view, Griffin is the ‘lighthouse project’ in the field of army cooperation. It starts at the German Army Headquarters, involves the 1st German-Netherlands Corps (1 GNC) as the top priority MN HQ and continues in the form of numerous initiatives which will knit our armies closer together. The following examples underline the high importance that is attached to these initiatives. Making use of the third dimension allows the military leaders of land operations to significantly increase tactical mobility of light forces, to rapidly project combat power also to close terrain, to respond in a flexible and responsive manner to situation developments and to shift points of main effort quickly if required, as well as to use air support to seize and retain the initiative on the ground. In the German ARMY2011 Structure, the Rapid Response Forces Division (Stadtallendorf), a new-style division, will integrate the capabilities of air manoeuvre, crisis management for German nationals abroad, special operations and Special Forces operations. Here, Army aviation forces, paratroopers, and special forces have been combined under one roof, with the purpose to make available complex air manoeuvre capabilities in a modular manner so that the respective functions can be employed showing the highest effective engagement capability. Moreover, for the first time, German and Dutch forces are brought together here to form a single division. They are integrated into a headquarters, commanded and controlled by a German Commander and a Dutch Deputy Commander and the attached 11th (NLD) Air Manoeuvre Brigade (11th AMB) will be NATO OPCOM: a German-Dutch division comes into existence. The spirit is perfectly reflected in the mottoes of 11th AMB: ‘Nec temere, Nec temide’ (neither rashly, nor timidly) and ‘Elke Missie, elk moment’ (any mission, any time) – the most striking description of the intention and the tasks of the Rapid Response Forces Division (DSK). Due to Joint Fire Support and the close cooperation with air manoeuvre forces, the operational effectiveness of the Rapid Response Forces Division will experience a quantum leap. In addition significant capability gains are generated by anchoring multinational cooperation in the structure; the close cooperation of the Rapid Response Forces Division with 11th AMB will definitely be a game changer in the near future. In the future, the capabilities of the German land forces will also be taken to a new level by Joint Fire Support (JFS) and the close interaction with forces of our Dutch partner – by precision of effect in terms of area and time and by means appropriate for the respective tactical purpose. The example of JFS demonstrates clearly what we have in mind when talking about the future viability of land forces: in addition to the intensive considerations concerning the further development of joint training, the discussion of ways of how to organize training cooperation ventures with partners is of tremendous importance. The cooperation in the field of artillery is an essential pillar of Project Griffin. It was only recently that the compatibility of the German-Dutch operational doctrines and their compliance with the NATO regulations on live firing were verified in Idar-Oberstein on the occasion of the combined military exercise Griffing Strike, the conclusion and highlight of a combined JFS training event. This is our next step forward from the artillery school to the JFS/Indirect Fire training unit, towards combined training to include combined JFS training courses. Training Dutch tank crews and providing them with updated knowledge about manoeuvre warfare closes their capability gap. This unique project, Dutch crews training with and using German armour, could serve as a format to be used on other weapon systems as well. Here I have the cooperation tanks/armoured infantry in mind. We are more than happy to be able to help the Dutch Army keep a unique capability alive. Although developed during the Cold War, during recent deployments in Iraq and Afghanistan the tank has shown that it still is a weapon of choice. All-weather capable and heavily armoured, it can easily and flexibly sustain in the harsh environments of today’s battlefields. This example again shows the basic notion of our cooperation: we must not permit one nation’s capability gap to open up wider security gaps for the defence community as a whole. Finally I want to mention 1st German-Netherlands Corps (1 GNC). The process initiated in the past years – Common Effort, comprehensive approach, interagency working groups, providing first-class multi-level exercises as a training platform (national or multinational) integrating military and civilian expertise, to mention but a few examples – has indeed achieved a great deal, has set new standards, also with a view to cooperation and development in the German Army. Both our armies are so close that it really makes no difference whether the COM, DCOM or COS is Dutch or German and the COM is directly answering to the respective Army HQ. The 1 GNC as part of NATO’s Force Structure and tier 1 HQ has proven what we all aim to achieve by multinational cooperation: to cope with common threats to the security of our nations and our peoples. This HQ has repeatedly underpinned its professionalism in the past, during its exercises and during operations – NRF-LCC rotations 2005 and 2008, and specifically during its successful deployment to ISAF in Afghanistan in 2003, 2009 and 2013. I am sure the corps has accomplished its third mission with ISAF again with the same spirit of excellence and professionalism as well. And the next objectives are already in sight: training and preparation for NRF as a LCC HQ (stand by phase starting January 2015); parallel 1GNC continues with its preparations to become a JTF HQ. The willingness of both countries makes me confident that this hurdle will be taken as well. The common goal is to support NATO and the EU, to provide an efficient force potential capable of commanding land-centric operations and to bring this to bear in an international context. That is what the Netherlands and Germany as Framework Nations of this HQ intend to keep doing in the future with the support of all states participating in this great HQ. The German army understands its role as a key leader of multinational cooperation in Europe. We attribute this not only to our geographical position, but also to our understanding of cooperation, of common training philosophy and of our future missions which will require the capability of working and fighting as part of a multinational force. Future cooperation will in particular include training and exercises where they are feasible and beneficial to both sides involved. Project Griffin stands as a role model for those future cooperations. And we will continue to use present forms of cooperation and collective structures to investigate with our partner nations where there is further room for integration or training-cooperation which will benefit both sides. This might cover sharing training and exercise capabilities from the unit level up to the respective HQ for deployments. Other examples might be in the area of costly capabilities with a high requirement of interoperability: Counter-IED, air-surface integration and Combat Service Support as well as the capability to link-up in the right way in order to cooperate with NGOs. We pursue a largely similar philosophy, and I welcome the intention of the RNLA to link to us even more closely than before in terms of doctrinal concepts. However, there are opportunities for cooperation that go even beyond that: for example, the intention of 43rd Brigade (medium forces) to cooperate more closely with 1st Armoured Division in the future. Being smart in cooperation is above all determined by the added value all participants will earn, rather than by military political symbolism. We cannot afford to invest in symbolism, we must invest in cooperation. A balanced contribution to mutual cooperation does not necessarily require direct reciprocity, but it should be to the overall benefit of all partners involved. There is no doubt that our active efforts will be required more than in the past. The more our budgets are cut, the more actively our cooperation must be shaped. This also means that we – Dutch and Germans – can proceed in a targeted manner where we really benefit from cooperation. I therefore intend to outline the course we are taking in the German Army reorientation towards a flexible and future-oriented full spectrum operational army. 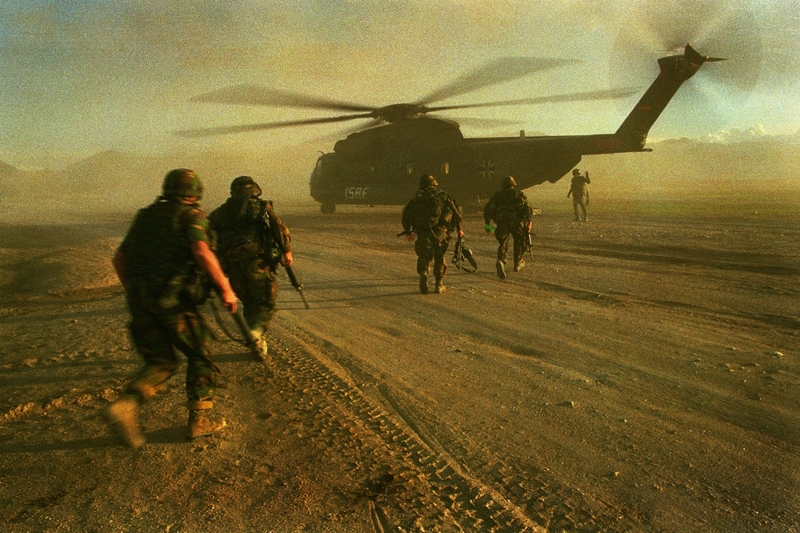 The capability requirements of the army are based on mission orientation. Therefore, we primarily have to identify and acquire partners that possess these required capabilities or that want to develop and employ them together with us, such as the Netherlands. And I want to make the case for perceiving us as a cooperation partner worthwhile, who is embarking on an innovative course and is attractive. We can definitely add value to each other’s endeavours and capabilities and we should do this in the most practical manner. Together we will deliver successful operations today and we will provide our nations’ options to face the challenges of tomorrow. Therefore, I am absolutely convinced that we will continue to commit whole-heartedly to this German-Dutch partnership: not everything is better but much goes better when tackled together. Bruno Kasdorf is Inspekteur des Heeres van de Bundeswehr.